Book your Bridal spray tan to look your best on that special day. Group tan rates available in our salon as well as Bridal spray tan parties. We will give you a natural glow and ensure that you look amazing in your bridal photos. Schedule your vacation tan and arrive at your vacation spot tan and ready to enjoy yourself. If you cannot come to our salon, We can come to you. Get a beautiful Brazil Bronze in the comfort of your own home or any private setting. Only you and our technician will know its not a real tan! Brazil Bronze specializes in the Man Tan. We have been spraying men of all ethnicity's and body types for 15 years. There is a special technique to spraying men, especially if body hair is involved. We also specialize in spray tans for bodybuilders to enhance musculature tone. Read what our customers are saying about us and feel free to submit your own testimonial for us to post on our website or social media account. Please include a photo of yourself with your beautiful Brazil Bronze tan. We produce the best spray tan solution with the highest quality DHA. All Brazil Bronze solutions are infused with organic and natural ingredients,. Our Solutions are made with purified water and have no fragrance or odor. Brazil Bronze supplies luxury salons and spas globally. Our solutions have been safety tested in the US, EU and South America. All Brazil Bronze spray tan solutions are paraben free, peanut free, phthalate free, sulfate free, cruelty free, gluten free and vegan. 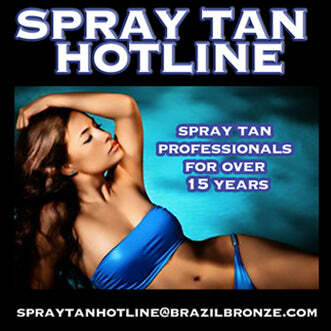 Brazil Bronze spray tan solutions are an ideal tanning solution for your salon or spa. 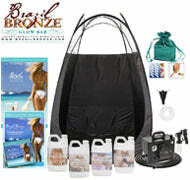 Our line of Brazil Bronze spray tan solutions and equipment includes products for professional use as well as at home use. Choose from tanning solutions to fit clients of various skin tones and with different tanning goals. Our spray tan solutions offer rich, natural color with no orange tones. 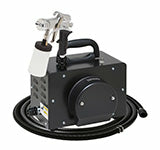 Our spray tanning equipment is of the highest quality. We also offer safety products and extras -- such as disposable thongs, sandals and hair nets. Our online store also offers a variety of retail products for at-home use. 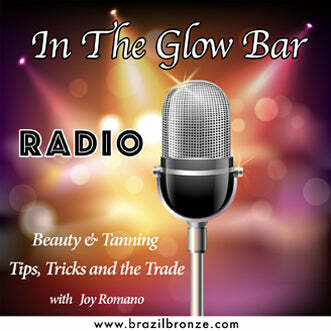 Our New at home Anti-Aging Tanning line includes Brazil Bronze Anti-Aging Spray Tan Mist & Brazil Bronze Tanning Mousse. In addition, Our long time favorites include Brazil Bronze Glow Stretcher, Brazil Bronze-Bronze Perfection, Brazil Bronze Spray Tan Mist, and Brazil Bronze Faux Tan Remover Soap. We offer products that exfoliate, extend the life of your tan and can create a tan just like you would get in our salon. Brazil Bronze has everything salon professionals need to create beautiful, natural-looking spray tans, as well as high quality self-tanning products to use at home. Try our organic and natural spray tanning solutions and enjoy the Brazil Bronze difference! 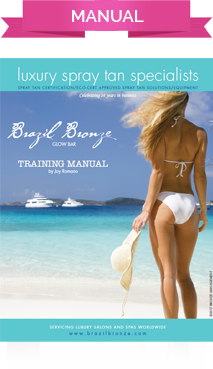 If you don't have time to get a Brazil Bronze Spray Tan Certification or just need a brush up on your technique, you can easily download our Video and Manual here. You will instantly receive 16 years of our tried and true techniques that we have perfected over the years.